Welcome. 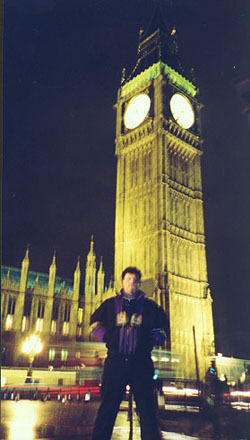 I, as you already know, am Demosthenes, and in January 1999 I went to London. I was accompanied by my beautiful traveling companion Valerie. We spent two weeks criss-crossing the city, and frankly, we still didn't see all that needed to be seen. I have put this little tour together, that way you can feel as if you were right there with us. Join us as we take the "tube" all over, seeing the sites. When you want to continue the tour, click on the Underground sign to move to the next station. If you want to return to the selection of tube stations, click on the Live from London graphic at the bottom of each page. We hope you enjoy this tour.